Free Shipping Included! 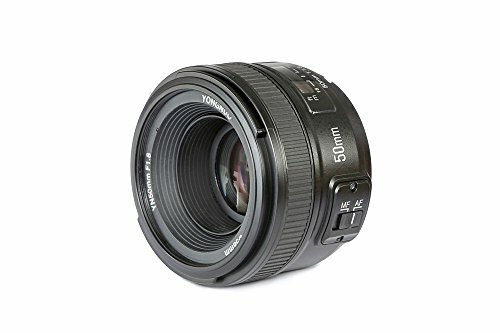 YONGNUO YN50mm F1.8N Standard Prime Lens Large Aperture Auto Manual Focus AF MF for Nikon DSLR Cameras by Yongnuo at Video Camera Authority. MPN: YN50MM Nikon. Hurry! Limited time offer. Offer valid only while supplies last. Specification:YN50mm F1.8 for Nikon version is released now, it's a great prime lens that is an excellent addition to the Nikon 12-50mm kit lens. YN50mm F1.8 for Nikon version is released now, it's a great prime lens that is an excellent addition to the Nikon 12-50mm kit lens. This lens gives you 3 stops or eight times (2x2x2) more light coming through the lens opening than standard f/5.6 kit lenses. Great lens for taking portraits, low light photography, street, casual shooting and everyday use. 7, Adopts high quality plastic as external structure, the overall weight is only 200g, which is convenient for outdoor shooting. 8, Multi-coated glass, effectively improves the transmittance and flare resistance.